Who says that you can never go back to the past? Evidently, someone forgot to remind the crew of Lillian Axe of this fact. 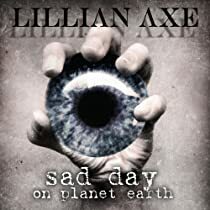 I was provided a copy of their upcoming release of Sad Day on Planet Earth (June 30) to review for this station and my first thought after listening through it completely for the very first time is that this disc has a lot of the classic Lillian Axe sound to it. I mean classic Axe material, like Love & War and Poetic Justice type stuff here. In addition to the press release given with this CD that mentions how the recording of this album progressed, Steve Blaze himself told me that they ‘busted their asses’ on this release and that he thought it ‘was their best’. He may very well be correct on that last assessment. Sad Day on Planet Earth may indeed be Lillian Axe’s best work ever and Axe fans know that this would have to be quite a piece of work for me to even consider making this statement. Right from the get-go the listener is lulled into a false sense of security with the opening instrumental ‘Cocoon’, then slammed into a dizzying frenzy with ‘Megaslowfade’. The musical onslaught continues with the track ‘Jesus Wept’, an instant Lillian Axe classic, then ‘Ignite’ and ‘The Grand Scale of Finality’ before the purchaser has a chance to catch his or her breath. There are, of course, the gratuitous ballad or two, including the CD’s namesake. Other tunes I found quite enjoyable were ‘Nocturnal Symphony’, ‘Cold Day in Hell’, ‘Divine’ and ‘Kill Me Again’. Honestly, this is one of those releases that I love to get because it’s great from start to finish, there’s no need to hit the ‘skip’ button on the CD player. Now, there are some who might say that Lillian Axe never deviated from their ‘signature’ sound, maybe even Mr. Blaze himself, but to me, the last release Waters Rising, while I found it every bit as much a Lillian Axe record as others, there just seemed to be something different about it, something that was seemingly difficult to put my finger on conclusively. Maybe it was because there really weren’t any up-tempo tracks on the CD, or maybe the new vocalist, who knows? Everything was pretty well mid-range in nature. But Sad Day on Planet Earth oozes the classic sound, is instantly satisfying and contains plenty of the quick paced tracks I have come to expect from these guys. Vocalist Derrick LeFevre seems to have found his comfort zone within the band now that he has completed his 2nd release. His vocals are crisp and although he can’t quite hit the notes of his predecessor, his vocal sound is a perfect fit for the band and this album. Most importantly, the shoes he has to fill now are his own and I’m sure that relieves some of the pressure of replacing a legend. And, obviously, it goes without saying that Steve Blaze continues to show fans and the world that he is the most under-appreciated artist in rock music in this reviewer’s opinion. He incessantly cranks out great musical content and Sad Day is absolutely no exception! He strives for musical perfection and it trickles down to all the members around him. Lillian Axe fans worldwide, you have been rewarded! Purchase your copy of Sad Day On Planet Earth now in the KNAC.COM More Store. Click here.